ASK FREQUENTLY WHAT IS NEEDED: During times of chaos, it is important to ask victims/survivors what they need and ask them often. Whether they require information, physical and emotional support, financial support or assistance with their employment, constant inquiry shows continuous support and a willingness to help. Victims do not respond in a predictable or linear fashion to crisis. They may not know what they need, or be able to clearly ask for it. It is important for victim services to be available in order to guide how to help these victims. UNDERSTAND WHO MAY REQUIRE SERVICES: In addition to the significant physical injuries, there may be a significant number of victims who are traumatized and these traumatic injuries evolve over time. People all around the world may be affected by an incident. Following the 2013 Boston Marathon bombing, it was estimated that 1000 individuals, in addition to those victims who suffered from a physical injury (280), were affected by the bombing. Seventy-five (75) per cent of identified victims lived outside the Boston area. These victims were located in thirty-one (31) states and in five (5) different countries. They may include family members of the injured, first responders, and nearby communities, who can experience a great deal of stress as a result of an incident. Victims are not just those immediately killed or injured in the bombing. Victims also include family members and response workers. Ask victims and survivors what they need and ask them often in order for them to begin the recovery process. BE ATTENTIVE TO A WIDE RANGE OF INJURIES: Physical injuries as a result of a bombing can be severe, and include the loss of lives and loss of limbs. It is important to recognize that invisible injuries can also result and include: traumatic brain injuries, hearing loss, and emotional trauma. Although these injuries are not as apparent as physical injuries, they can significantly affect quality of life. It is important to enhance outreach efforts from the “visibly injured” to include those suffering from “invisible injuries”. First responders are not necessarily equipped to deal with all these injuries at once; therefore, a coordination of services is needed to effectively assist victims with many different needs. ADDITIONAL HARDSHIP CAN RESULT FROM INJURIES: Family members of the physically injured victims may experience emotional exhaustion and trauma. People may need to take time off of work to stay with their loved ones in the hospital. Some people will not be able to return to work for a long period of time because they are caring for their injured loved ones. Social workers or advocates may be needed to assist family members who are acting as caregivers. COORDINATION OF SERVICES: Many community-based, municipal, provincial/territorial, federal, and private sector entities may be needed to develop streamlined and comprehensive services. Sometimes an emergency service contract may be necessary in order to serve victims. Areas of need may include: crisis stabilization services, rehabilitation/occupational health, behavioural health services, counsellors/therapists, advocates for deaf and hard of hearing, etc. PHYSICAL LOCATION OF SURVIVOR RECEPTION CENTRE/FAMILY ASSISTANCE CENTRE: Consider locating the Survivor reception Centre or Family Assistance Center near the hospital if there are many physically injured victims. Following the 2013 Boston Marathon bombing, family members did not want to leave their injured loved ones in hospital, so they did not attend the FAC. A mobile FAC would be convenient and helpful to victims and families. It could conduct a formal needs assessment, address victims’ needs early on and continue to track their needs. A formal needs assessment allows service providers to effectively and appropriately support victims/survivors. 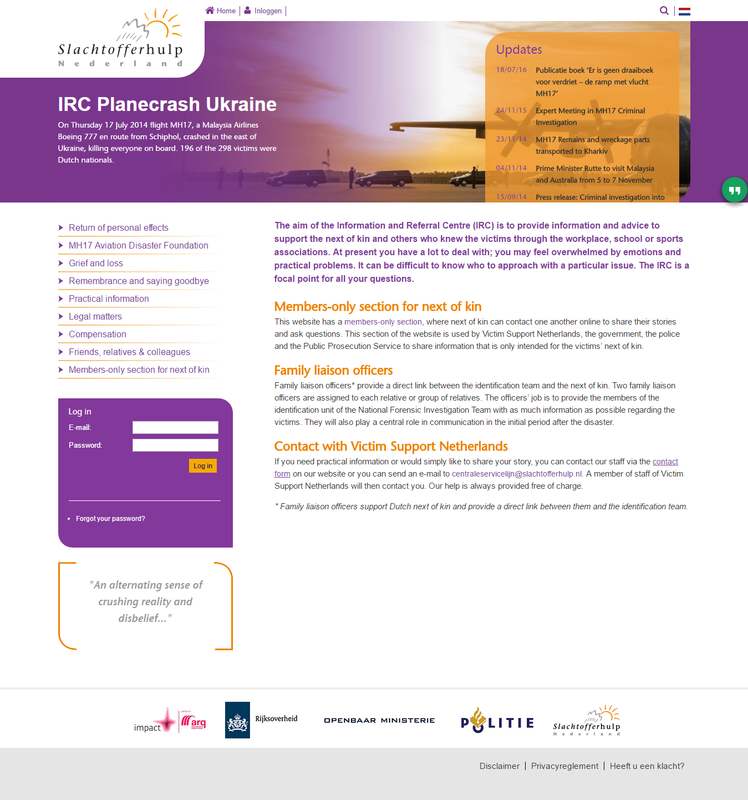 LAUNCH INFORMATION WEBSITE ASAP: In the days following the July 2014 downing of flight MH17 over the Ukraine, the Dutch government quickly set up a very detailed Information and Referral Centre (IRC) website for next of kin, relatives, friends and colleagues of the 196 Dutch nationals killed. It provided people affected with information about: return of personal effects, the MH17 aviation disaster foundation, grief and loss, practical information, legal matters, compensation, remembering and saying goodbye, a friends, relatives and colleagues section, and a members’ only section for next of kin. It is a great example of keeping victims informed. PRIVACY: Medical facilities such as hospitals may be legally required to protect their patients’ privacy and/or may refuse to allow other authorities into the hospital to provide information to their patients. Such scenarios can make it very challenging for victim support services (both government and community-based) to reach and help these victims. Victims may be too preoccupied with their injured loved ones to consent to the release of his/her information to victim services. Pre-planning and memorandums of understanding can help ensure programs are able to work together in order to provide the most effective assistance to victims. CENTRALIZED REOURCE/SUPPORT AGENCY: It may be advisable to have one allocated agency act as a resource centre for all victims who need assistance. This agency can make referrals and assist victims/survivors over the longer-term, as they cope with their health and their injuries. It should serve the needs of all victims affected by the tragedy. Having one agency makes it much less confusing for victims/survivors and can direct and support them as needed. ONLINE SURVEY TOOL: Consider developing an online survey tool that can also help victims physically locate the services they need. The tool can track unmet needs and ensure they are addressed. Specialized services that exist like services for traumatic brain injuries and hearing loss can be linked/shared with victims/survivors through this tool. VICTIM NAVIGATORS: Consider hiring specialized staff to help victims navigate through different systems. These navigators may be victim service providers with creative and advocate backgrounds who direct victims to the appropriate service. Part of their function is to conduct a formal needs assessment and commit to the ongoing assessment of victims’ needs. Victims’ needs may be health-related or they could require mental health services, assistance with their employment, their finances or their behaviour. COMPENSATION: Compensation schemes need to take into account the overall impact of an injury and the age of the injured party. Invisible injuries (hearing loss and traumatic brain injuries) may need just as much funding or more funding, than physical injuries (such as homicide or amputation). It is also important to consider basic needs. Behavioural health responses are not always the first priority. People need shelter and food first and foremost. In many tragedies, responders have found people will not to go to counselling to talk about psychological and mental issues if they do not have the primary necessities. Once they are provided with basic needs, they can begin to think about their mental health and any invisible injuries they may be experiencing. NON-THERAPY ACTIVITIES: In the weeks and months following the incident, it may be a good idea to offer victims/survivors some non-therapy activities. Examples are: education forums to connect survivors with their peers; video conferences with survivors who are not local so they can talk together and access services; yoga sessions to help relieve some stress, etc. MEDIA AND OUTREACH CAMPAIGNS: Media and outreach campaigns can be created to help reach victims. They can provide psychological education for those who were affected. They encouraged victims that their reactions to violence are normal. It is important to ask victims what they need and provide them with support. Otherwise, victims will be affected by the trauma to a greater extent if they do not seek the help they need. VOCATIONAL REHABILITATION: Local colleges and universities may be able to assist victims/survivors who are unable to return to work because of their injuries. Academic institutions may be able to offer training programs or provide scholarships for injured survivors so that they can commence a new line of work. SCHOOL-BASED EDUCATION PROGRAMS: Can be held in public schools to inform students about trauma and provide them with any help or answers they needed. Young people can experience a great deal of trauma which can negatively affect their health as they age. IMPROVING COMMUNITY ACCESSIBILITY: Sometimes government departments can leverage existing program funds to improve infrastructure as a result of an incident. Following the Boston Marathon bombing, the Massachusetts Department of Public Safety was also involved in assisting victims by installing ramps, widening doorways and making public places more physically accessible to those who were injured. COMMEMORATION: Survivors and experts from relevant organizations may wish to create a memorial book, as an example of an act of commemoration. Following the downing of MH17 over the Ukraine, a book was created to commemorate the victims, describe the experiences of the interviewed survivors and the professionals who supported them over the years. The book was also available digitally. A similar book of remembrance was made for the families who lost loved ones in the 1985 Air India bombing, years later when the assailants were tried in criminal court. The Lessons Learned are primarily examples adapted from the presentation: “Supporting Survivors of the Boston Marathon Bombing”, Massachusetts Office for Victim Assistance. There is also reference to the airline disaster on 17 July 2014 in which flight MH17, a Malaysia Airlines Boeing 777 en route from Schiphol, crashed in the east of Ukraine, killing everyone on board (196 of the 298 victims were Dutch nationals). Many of the practices highlighted in this text have been adopted in other incidents of terrorism or mass victimization.